This interface represents a whole XDI graph. 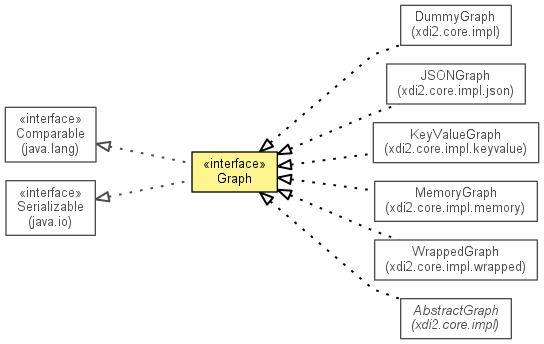 XDI graphs consist of context nodes, relations, and literals. Also, an XDI graph can be expressed as a set of XDI statements. Clears all data from the graph. Commits the changes made by the transaction. Check if a statement exists in this graph. Returns the number of all statements in this graph. Gets all statements in this graph. Gets the graph factory that created this graph. Returns an optional identifier to distinguish graphs from one another. Gets the local root context node of this graph. Gets a statement in this graph. Checks if the graph is empty. Rolls back the changes made by the transaction. Sets a statement in this graph. Check if this graph supports transactions. Converts the graph to a string in the given MIME type. Converts the graph to a string in the given serialization format. subgraph - This is simply a hint to the implementation whether child context nodes will subsequently be requested. Implementations may or may not actually use this parameter. The graph's local root context node. Closes the graph. This should be called when work on the graph is done. format - The serialization format. parameters - Parameters for the serialization. mimeType - The MIME type.